I'm now 7 weeks post injury. The first few after my sprain, my ankle was non-weight bearing. Frank was an angel and rented a knee scooter for me to use once he saw how bruised I was from using crutches for only two days. It was heaven sent, and worth every penny. I'd use the scooter outside the home, and crutches in the apartment. I somehow managed to tweak my elbow the first week using crutches. A tinge of pain would travel up and down my arm in certain positions, which made sleep a difficult task. I could rarely find comfort for my neck/shoulders, elbow and ankle. It grew old quickly. My elbow is improving, it is far less often I aggravate it. As for the ankle, I've been out of the boot since Thursday. Now, I waddle in my lace up brace. I'm anxious to get back to normal, but in order to do so, I'm going to need surgery to repair my ligaments. Otherwise, I'm stuck with a loose ankle, and it will be a matter of time for re-injury. I was hopeful that I could opt for surgery right after the injury, but my Ortho quickly nixed that plan. He informed me that I'd need to wait for swelling and bruising to reduce, and scar tissue to form to prevent him from being overly aggressive during surgery. At five weeks, I had an MRI. It showed evidence of grade 2 sprain at the ATL and calcaneofibular ligaments, which are most commonly injured, and I also tore the LCL at the calcaneocuboid joint. I can proceed with surgery as soon as I'm ready. The soonest I can schedule it is mid-July. The last month in the boot has been roasty toasty in triple digits. I'm opting to postpone for an additional 4-6 weeks to avoid the summer heat. I'll be in a cast after surgery. A sweaty confined foot in 105+ sounds like a bad combination, not to mention a haven for bacteria. So, I'd rather limit the risk for infection, avoid stinking to the highest of heavens and get it done in September. The ortho doesn't have issue with me waiting, only negative I can see is the delay in rehab since I'll be starting from square one. I think the pros outweigh the cons so I plan to enjoy my summer and reboot - literally, this fall. 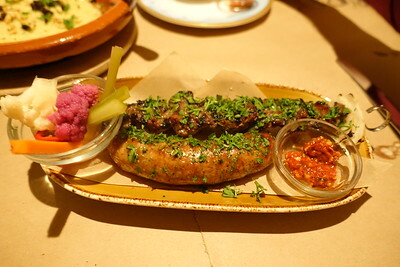 We chose Cleo at SLS for our final hurrah during Restaurant Week. We had no trouble securing a reservation via opentable with only an hour's notice. This dinner was just Frank and I. Though, it would've been a good choice for a group because much of the menu is served family style. It would've allowed us to sample more items, but fear not, we had ourselves a feast for $40.15 per person (+$16 for lamb). The restaurant itself is rather peculiar, but I liked the quirkyness. I really admired the open kitchen. Service was attentive, management checked in a few times to be sure we wanted for nothing. That attention to detail is a nice touch. We thoroughly enjoyed the first course. We loved both the Hummus and the Spicy Cigars. The laffa bread took us directly to carb heaven. It was light, airy and perfectly seasoned. 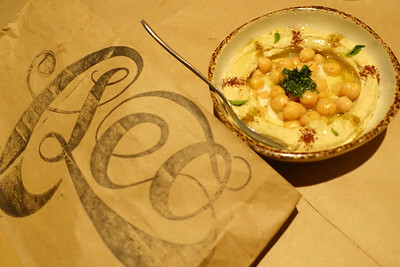 Ideal for dragging it through the smooth and creamy hummus. 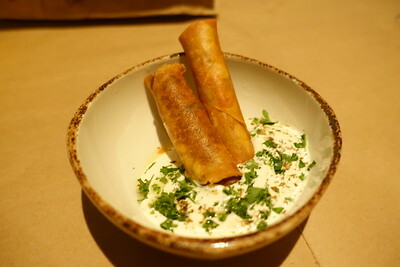 The Spicy Cigars were like meaty spring rolls, they were packed with flavor and pleasantly cooled with the tangy sauce. Consuming ten of these bad boys would be an easy feat. 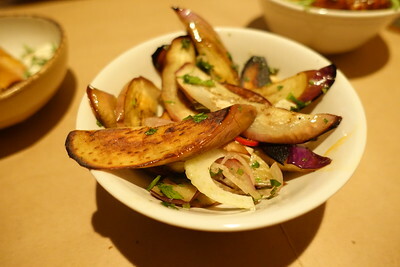 Next were the Spicy Potatoes & Eggplant. The potatoes didn't have much kick, but they were loaded with flavor. I think I misunderstood "spicy" but they were satisfying. The eggplant, on the other hand, was a dud. A little disappointing, but it left room for other tasty bites. 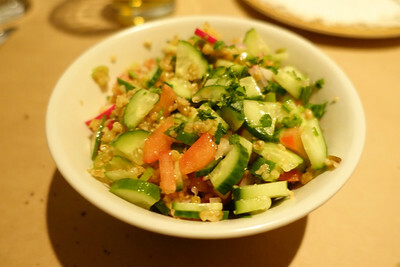 Next we were each served a portion of Chopped Salad. Frank thought it had too much cucumber so I took his home as leftovers. I loved the salad! It was so fresh, crisp and filled with bright flavors. I've never had freekeh before, I am now a fan. It's a bit nutty and chewy, it was a perfect fit in the salad. It was delicious the next day too. Moving on to the entrees we had Beef and Soukouk Kebabs with Saffron Rice, Couscous and Seven Vegetable Soup and Lamb Tagine ($16 add-on). The kebabs were my favorite both with bold seasoning. Frank was fond of the lamb. 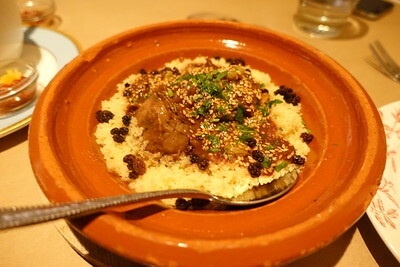 I admit you cannot beat the tenderness achieved in a tagine. 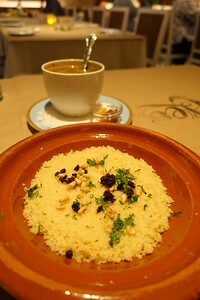 The couscous was pretty dry and the soup was bland until we added some zest with the harissa. 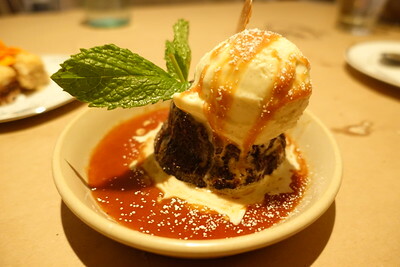 Sticky Toffee Pudding seemed like an unlikely option at a Mediterranean restaurant, but it was extremely delicious. 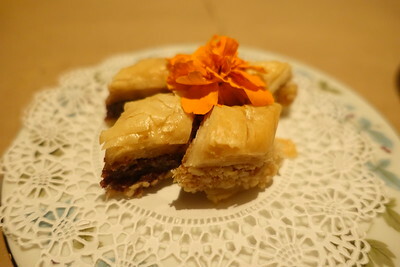 Baklava was prepared two ways and they were fine versions, but it was our least favorite dessert. Beers and cocktails were a bit steep; Weihenstephaner ($10) and Stella ($9). But it didn't stop us from ordering them anyway. 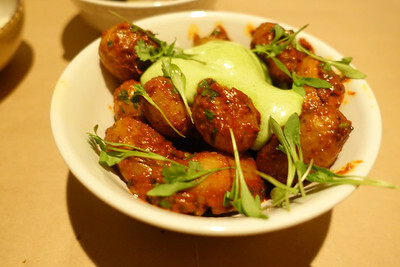 Cleo is a fun twist on tapas and it's rather unique. It definitely fills a niche on the Las Vegas strip. "Human rights for everybody, there is no difference. Live on! And be yourself!" 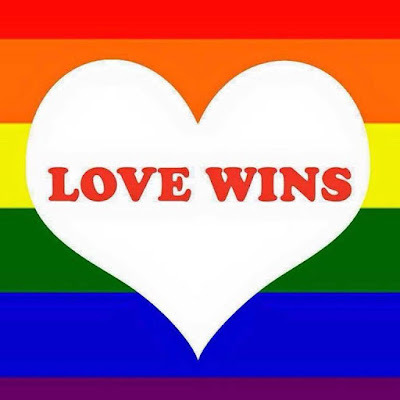 -- Macklemore & Ryan Lewis. 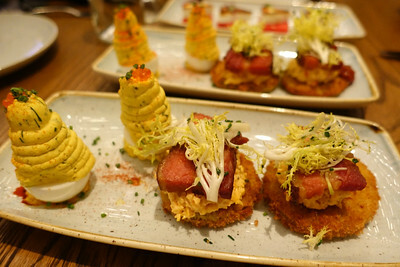 Yardbird at Venetian was another restaurant that piqued my interest during Restaurant Week. After success in Miami Beach, the Las Vegas location opened about six months ago. I must admit I don't dig fried chicken, so I was in no rush to check it out. However, the restaurant week menu convinced me. 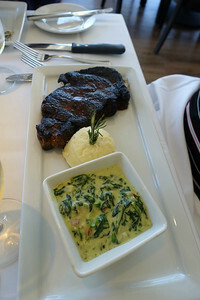 It seemed to showcase much of their menu at the reasonable price of $40.15 per person. We had friends join us, our party of four was promptly seated in the center of the dining room for our 7:30 reservation. 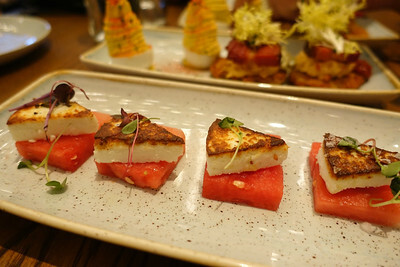 In addition to our restaurant week appetizer, we got started with Warm Farmer's Cheese & Watermelon ($5) it is a refreshing bite that is equally salty and sweet. A nice way to whet our appetite. Extreme richness followed with Deviled Eggs, the stiff peaks were topped with trout toe. The stunner was the Fried Green Tomato BLT. I've never had anything like it and it was mighty delicious. Crispy, creamy, salty, smoky... it was a fiesta for my taste buds. No one in our group opted for the shrimp & grits. 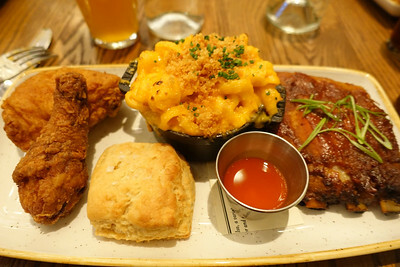 Instead, we each had the 27 hour Fried Chicken and House Smoked BBQ Pork Ribs, with a side of Mac & Cheese and biscuit. We were blown away by the portion size. No one was going hungry tonight. The chicken is moist and it has excellent flavor - considerably better than most, but when it comes to fried chicken, I want crunch. Unfortunately the breading was soggy. Still, I liked it better than the Pork Ribs. The mac, was extremely cheesy. I cannot believe I'm saying this, but it was too cheesy. I wanted bits of bacon or jalapenos to make it more complex. Once I ate the crispy topping, I lost all interest in it. The biscuit was fantastic. I only wished there was honey or butter to slather on it. It took us an extremely long time to receive dessert. We began to wonder if they were milking the cows to make the ice cream. 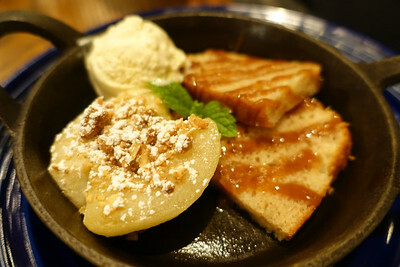 I found the Apple Praline Bread to be worth the wait. Warm desserts with a cold ice cream is a weakness. 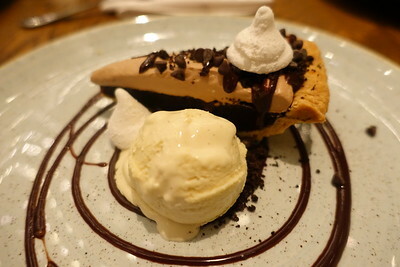 The Mississippi Mud Pie was rather run of the mill. Overall, I was satisfied by the experience. It was a ton of food! Even if it wasn't all quite up to par. It is a fine choice to share some comfort foods among friends. Restaurant Week benefiting Three Square Food Bank is already underway; it runs thru June 26th. There is a good number of participants this year, but I'll be honest, not too many piqued my interest. I selected three I really wanted to try. One was Buddy V's at the Venetian. We dined with a group of nine. Service was a bit sluggish at times, but otherwise attentive. They started us with delicious herbed focaccia which paired well with oil and vinegar. I only wish they left the bottles on the table so we could help ourselves. We didn't know upon ordering, but draft beers in the 20 oz and Liter sizes come in a souvenir glass with $9 refills (the cost of a pint). So, that was a nice surprise when ordering a second round. The restaurant week menu is $40.15 and it came with choice of appetizer, entree and dessert. The majority of the table ordered Grandma's Meatballs, made with beef, veal and pork. They were tender and juicy, the marinara sauce was nicely balanced and flavorful. I was quite pleased. 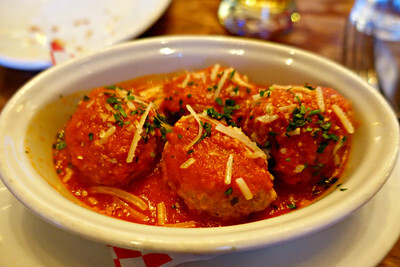 Likely, the second best meatball in town. Those that had the Panzanella Salad seemed satisfied, the mozzarella was very fresh. The table tried each available entree: Pasta Bolognese, Sea Bass, Carbonara, and Chicken Parmesan. Each were beautifully prepared and damn tasty. 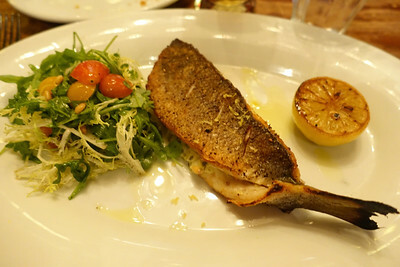 My Sea Bass was perfectly seasoned and brightened with a spritz of lemon, the side salad was fresh and light, which was welcomed since I was already pretty full. The chicken parm came with a nice helping of pasta and two lightly breaded baked cutlets topped with mozzarella and provolone cheeses. The pasta across the board was the ideal al dente. And for dessert we had a choice of tiramisu or cannoli. Both were well executed and scrumptious. 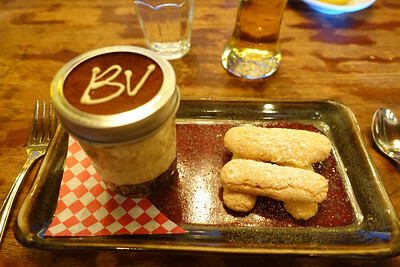 I loved dipping the lady fingers into the layers of the creamy tiramisu. The cannoli was filled end to end with no hollow center. I was a little skeptical, but dinner was delicious. Many celebrity chef restaurants fail to deliver, but that's not the case here. 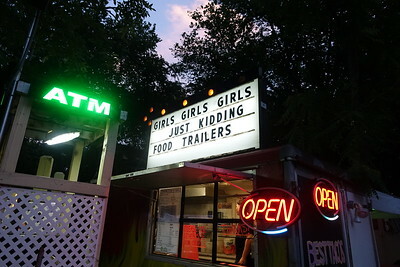 It has good eats and casual charm. If you have the opportunity, there's still time to check out the restaurant week menu which is an absolute steal. It's well worth navigating the labyrinth that is the Venetian. Don't park at Venetian like we did, I believe Palazzo self parking would provide better access. Back in April, my mom celebrated her 57th birthday. She has lived in Pahrump for many years, yet, we had never been to the Pahrump Winery. 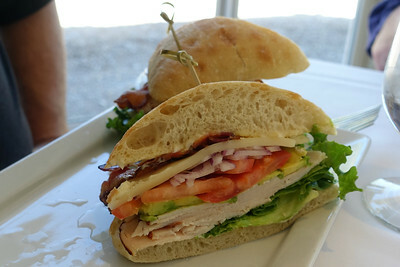 The occasion was the perfect excuse to visit the winery; we made lunch plans at Symphony's Restaurant. The original vineyards were destroyed by wild horses in the 90's. Years later ownership changed over Bill and Gretchen Loken; and that's when something special was born. By partnering with nearby growers they were able to produce the first commercial red in Nevada - it was such a success, it even won a gold medal. 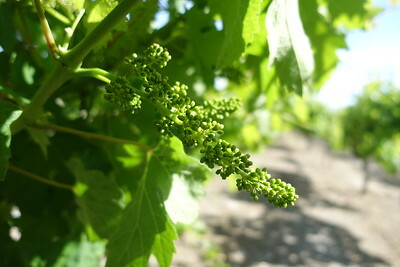 Not bad for a small estate vineyard in the Mojave Desert. They've since formed bonds with growers in both the Silver and Golden States, which have produced dozens of award-winning wines. This little winery even went global a few years ago when they started exporting to China. They've really made a niche for themselves. 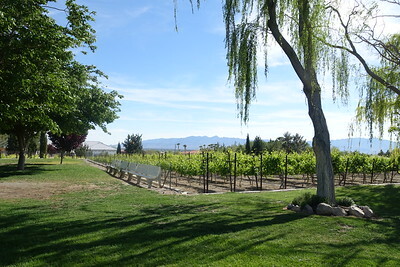 Symphony's has a lovely enclosed patio that provides sweeping views of the vineyard. We were fortunate to secure a table right by the window. The four of us made our wine selections - Desert Blush, Symphony, Chardonnay and Sauvignon Blanc. Cheers! Then, we pondered over the menu. The wines did not disappoint. My mom has never acquired the taste for wine, but she really enjoyed the Desert Blush. We might have an oenophile among us yet. Each of our entrees were really delicious. We also enjoy the french onion soup that got us started. Dishes ordered were the Winemaker's Club ($11.95), Blackened Boneless Ribeye ($32.95) and two orders of the Steak Au Poivre ($29.95). The steaks came with your choice of two sides, the selection was varied and all were very good. 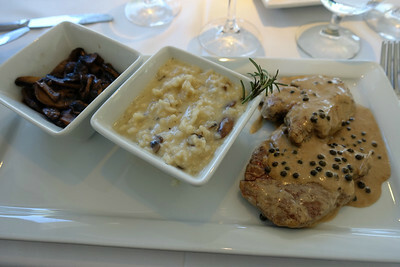 I was really blown away by the mushroom risotto - rich and creamy! Prices are very reasonable by Vegas standards, service was attentive and friendly. It was such a pleasant afternoon. This is a real gem tucked away in Pahrump definitely worth the day trip from Las Vegas. Back in February, when Frank and I returned from Mexico, I learned that my mom signed up for hospice while we were gone. I was completely caught off guard. I knew the day would come, I figured we'd take time to meet with hospices and find the one that was the best fit. I never expected it to be a done deal. I had concerns, but I knew my mom needed more help. After talking with the hospice nurse, and gaining a better understanding many of my concerns were alleviated. My mom could opt out at any time, but in the meantime a nurse would attend to her once a week, she'd receive help from a CNA and her drugs would be covered. It could be a real blessing, I felt it was best we try it out and see how it went. When hospice is mentioned most people associate it with death. It does provide end of life care, but they also do much more. It is a service that is underutilized and misunderstood. Most wish they would've sought it out sooner. Thankfully, my mom's primary physician recognized the need and initiated it. You do need a diagnoses of a terminal illness to qualify. My mom had real difficulty with "six months to live" in black and white. Who wouldn't? The service provides palliative care for those who are no longer seeking treatment for their disease. The focus is to maintain the best quality of life. In my mom's case, this meant allowing her to live alone and be independent as long as possible. These are her wishes, and I will stand by them. In addition to hospice home care, there is an inpatient facility, which also provides respite care, and there is continuous care during a crisis. Home care provides my mom with all the medical equipment she needs, oxygen, breathing machine, walker, wheelchair, etc. With hospice we've been able to get more than one O2 concentrator when requests were previously denied. Which is a huge deal! They are awkward and too heavy to be lugging from room to room, not to mention between my house in Vegas and hers in Pahrump. All medicines directly related to her lung cancer and lung disease (COPD) are covered and delivered directly to her home. This is a huge convenience since the nearest pharmacy is miles from her home. She has a nurse that visits with her once a week. She can obtain medical assistance 24/7. This was huge for me. Living in Pahrump, your access to care is very limited. Urgent care keeps banker's hours, doctor's take months to see and the hospital does not provide specialty care. They often transport patients to Las Vegas by air or ambulance for necessary attention. It takes an hour for me to get to my mom, and another hour to get her to a Vegas hospital. Those two hours make me extremely nervous, so anytime she wasn't doing well, I'd make her stay in Vegas so we were close to the hospital and her team of doctors. This would keep her from her three dogs and the comforts of home, which would only add to her stress. Having help a phone call away was a huge relief. It's not perfect, we do get the "can it wait til morning? Because no one in Pahrump is on call" excuse. Pharmacy deliveries only happen in the afternoon so if the order is wrong, a day is lost before she gets the medicines she needs. But it's better than nothing. My mom did really well the first few months on hospice, she was getting the medicines she needed and she was feeling significantly better. When Amy and the kids came to visit in April, she was more active, but the lack of rest took a toll on her. Combined with spring winds and poor air quality, her health declined over the month of April. She was up all night and sleeping during the day, her pill schedule was out of whack and it seemed she was under/over medicating. To make matters worse her blood sugar has been out of control and she's been fighting a slew of side effects from the Prednisone. Which culminated into a really rough weekend for my brother while I was in Texas. Thank goodness, he was there for her, though. Mother's Day she was completely out of it, howling in pain, etc. Today, she's able to recall very little from that day. It was scary. Monday, hospice arranged for her to be admitted into inpatient care. They will provide transportation, but it would have taken hours so my brother drove her to the facility. This mishap was disappointing, because when she started hospice I was told if there was ever an issue she would be immediately transported and I could meet them at the facility which is in Las Vegas, about ten minutes from my home. At least, we were testing the water before it was a crisis. The inpatient facility is meant to feel like home. You can bring in food and drink. Even Tuco, my brother's dog came for visits. My mom could have even had her shepards visit. My mom spent five days in their care, while they tweaked her medicines. She was doing exceptionally better when she left. All the staff is wonderful. They allow patients to rest, they are not constantly poking and prodding like in a typical hospital setting. They don't keep a tight schedule for vitals and such, so it took a little adjusting to learn their way of doing things. My mom preferred it greatly over her hospital stays. She went back home with her new medicines and she's done better the past three weeks. However, she since found a growth in her groin. It's the same place that was biopsied twice, but we never got answers due to a poor sample. Given her recent decline and symptoms, she decided to have another PET scan. She had to stop hospice to proceed with the test and meet with her oncologist. Tuesday, she had the scan and yesterday we met with her doctor. My mom was a wreck while we waited for results. She anticipated the worst, I expected little change since January, but to both of our surprise she got the most amazing news - THERE IS NO EVIDENCE OF METASTATIC DISEASE - Against all odds, her lung cancer is in remission. It took hours for it to sink in. But once my mom finally believed it to be true, it was such a relief. My hope is that my mom will be able to resume hospice and continue the care she needs. So, she is able to best enjoy whatever time she has left, whether it is two months, two years or two decades. Cancer has taken so much from our family, but it's also gifted us with important lessons. Life is simply too short; so live with a forgiving heart, never lose hope and always love like there is no tomorrow. I know what a gift this is, my heartaches for those who aren't so lucky. I would never wish these challenges on anyone, but when you are faced with such struggles there are people and services to lend a hand. You are never alone. 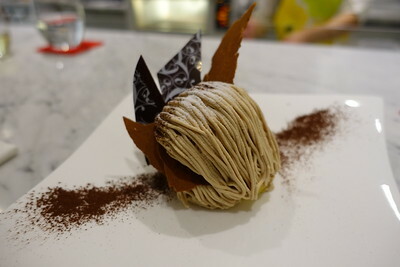 After dinner at Inyo, we met Frank for dessert at Sweets Raku. The restaurant is first come, first serve. After a few short minutes, we were seated at the counter. 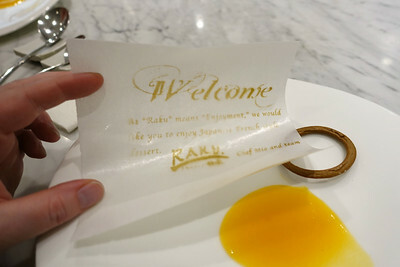 To begin, we were presented with a welcome letter from Chef Mio and team. 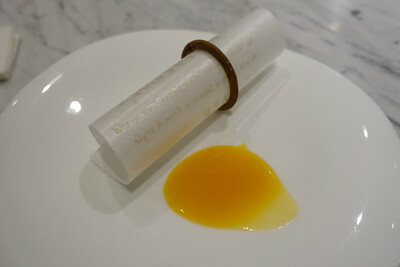 It was edible and served with an apricot sauce for dipping. It was a playful way to kick off the experience. We each selected the two course dessert for $15. Frank and I both chose Mt. Fuji and our friend opted for Jack in a cup. 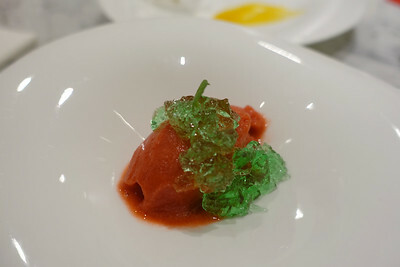 We began with strawberry sorbet and mint jelly. The strawberry flavor was intense and the sorbet was light and refreshing. It was a nice start. I do recommend a seat at the counter so you can watch these beautiful plates come to life. The details are fantastic. The chef's handiwork is definitely an art form. When Mt. Fuji was presented, I couldn't wait to dig in. However, the flavors fell a little flat for me, all the cream was a little overwhelming. I must admit I had dessert envy as delicate pears were filled with care and while the intricate tart was skillfully sliced, before me. I couldn't help but feel I chose poorly. I found the Jack in a cup more satisfying. It's a play on bread pudding and chocolate souffle. Even after suffering a bit of dessert envy, I would definitely return. That tart will be mine. I trust that or another dessert will be more to my liking. I really appreciate the deft skills at work here and that the desserts are mildly sweet. It strikes the right chord with my - not so sweet - sweet tooth. 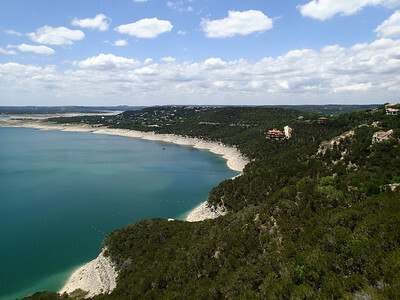 We spent a lot of time outside of Austin, just driving seeing the sights. 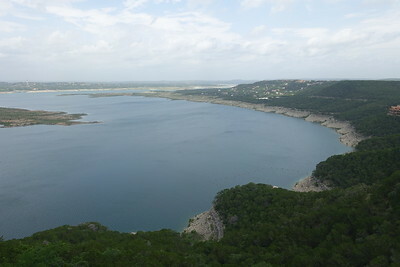 We were all over Hill Country, San Marcos, Llano, Lake Travis and Horseshoe Bay. 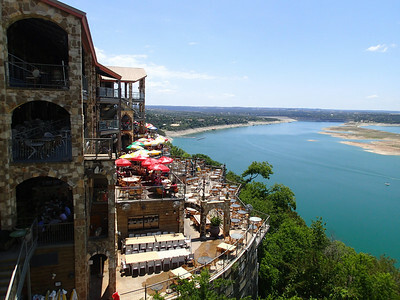 The Oasis at Lake Travis wasn't a complete ghost town this time around, but the retail spaces remain vacant. 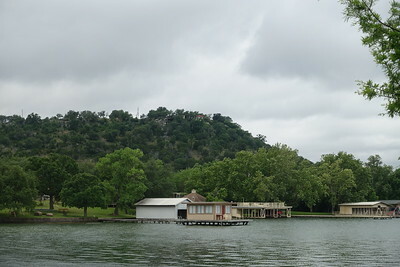 It was good to see a noticeable difference in the water levels of the Lake. Keep in mind this is before the heavy rains that fell Memorial Day Weekend. 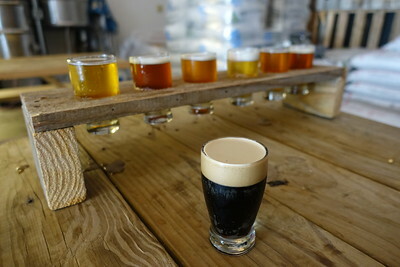 Near Lake Travis, we found an amazing brewery called Infamous Brewing. 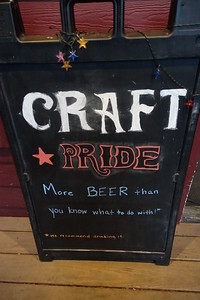 It's extremely casual and low key, but the have some great beers! 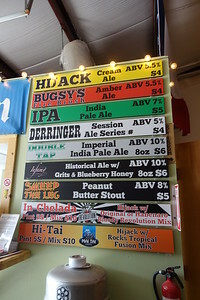 They're likely most famous for their peanut butter stout. A little too much like dessert for me, I really wanted a scoop of ice cream in it. But it was yummy. The bartender says people do bring in quarts of ice cream just for that purpose. I dug their IPA. It's a great stop if you're in the area! 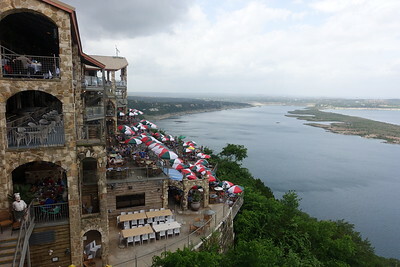 After driving back from Llano, we cruised through Horseshoe Bay which is primarily vacation homes. I bet in peak season the area is bustling. 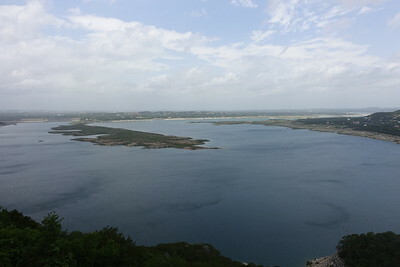 Lake LBJ was as still as can be on our visit. 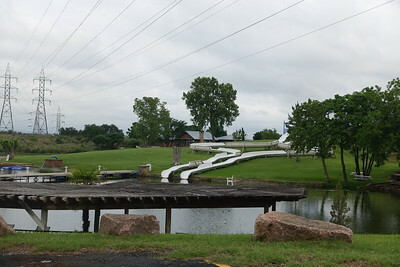 Not a soul was spotted, but it looks like it can be loads of fun with slides and cabins on the water. 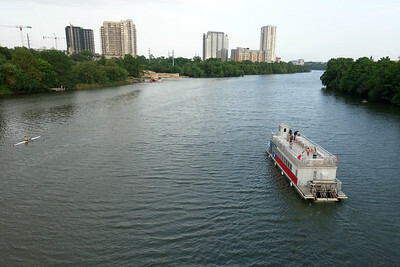 Austin is a great getaway. I'm happy we were able to explore it more this time around. I definitely want to return. Getting home was breeze. Dollar called a wheelchair for me when we dropped off the rental. So, we had assistance getting to the gate and pre-board status. I was incredibly thankful. That's a long way to go on crutches. I iced my foot and kept it elevated until it was time to go. I knew how bad swelling can get when in flight so I was prepared. That flight from Mexico ten years ago was brutal. I thought my foot was going to explode. This time was uncomfortable but my toes never felt like they'd pop like balloons under pressure. 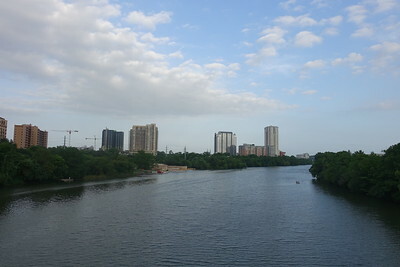 Downtown Austin is broken into different districts. 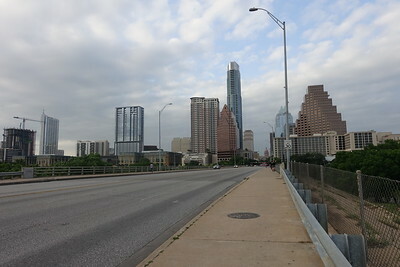 We frequented a few of them; Congress Avenue is at the heart of the city most famous for bats and surrounding high rises sprouting up like dandelions. 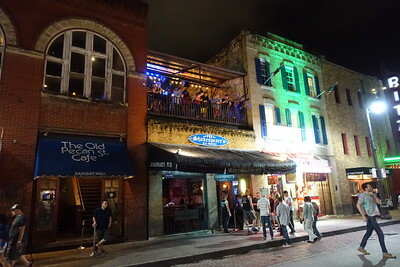 Sixth Street is the entertainment hub of the city. 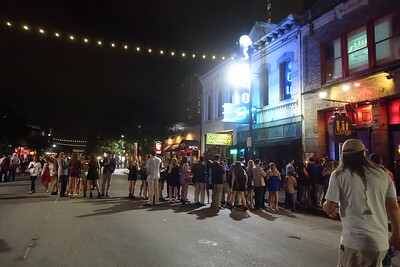 The streets are lined with clubs, bars and music venues. 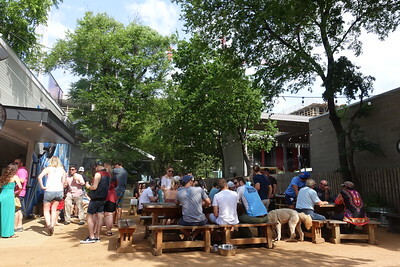 Rainey Street was new to us this trip, it's a historic residential neighborhood that was rezoned as part of the Central Business District. 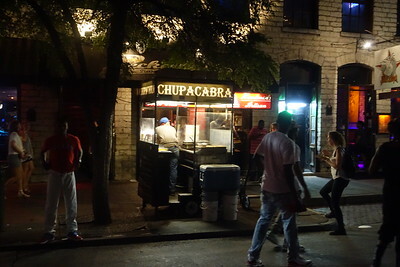 As a result, the old homes have turned into bars and restaurants. The bungalows offer porches and large backyards. It creates a fun and relaxing vibe. Everyday is Sunday Funday in these parts. 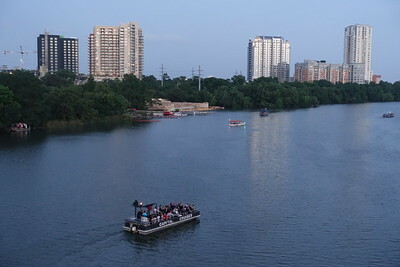 Last trip, we caught the bats emerge from the Congress Avenue Bridge purely by accident when driving by. This time, we made a point to see them. I wanted photos. We arrived early to secure a good vantage point on the bridge. We took in the sights while we waited. 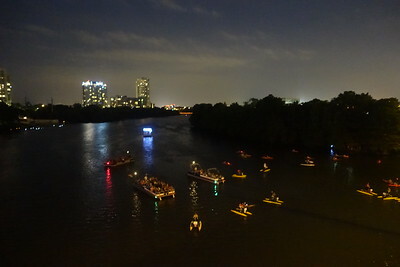 Darkness fell, the bridge was lined with folks as many as four deep, the river banks were filled with onlookers and the river was loaded with kayaks and other watercraft all of us were waiting to spot the bats. But they were a no show. We foolishly waited nearly three hours, finally giving up about 9:30. A passerby on a bike shouted that they hadn't been out in a couple weeks. It seems like there was no sign of them last week either. If anyone happens to know what happened to the Congress Ave bats, please share. I tried researching it, but turned up no details and when calling the bat line for info, it's automated and there was nothing indicating that they hadn't been seen recently. 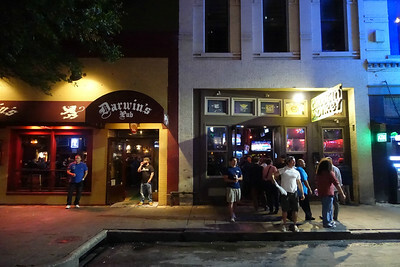 We walked Sixth Street on Friday night, it was closed to traffic and pedestrians were free to roam. We were with friends, and The Gatsby was suggested as a place to stop to give a live band a listen. It wasn't too crowded, there was no line or cover. We sat on the upper patio, we liked the low key atmosphere and Frank was able to enjoy a cigar. We spent a couple hours there. 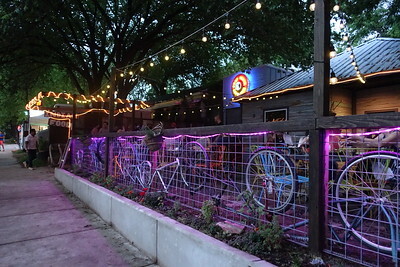 Rainey Street was my favorite. The block is super cute with tree lined streets and remodeled homes turned businesses, with few food carts thrown in for good measure. 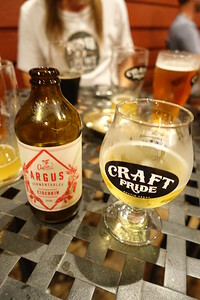 It was Banger's that brought us here, and we hung out at Craft Pride afterward. 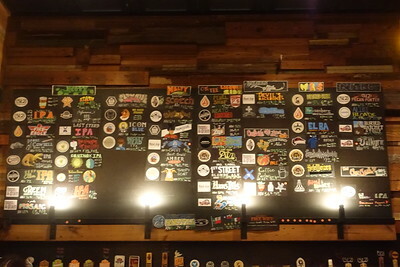 Excellent beer selection & chill vibe. We had such a good time, Frank and I went back for more fun on Sunday. After we were dropped off by Uber we stopped by the Bungalow for an alcohol infused slushy. The sign on the sidewalk enticed me, it sounded so good - a perfect cool treat since it was warm and humid. I had about half before I tired of the sweetness. We left and set off on our bar-hopping adventure. We crossed the street and we were walking along the sidewalk, Frank was a few steps ahead of me. I heard live music and I turned my neck just for a second to see if they were in the backyard of the house I was passing. It was just long enough to distract me from the uneven sidewalk that met the drive way. The next thing I knew I was on the ground in intense pain. Time seemed to stop, but seconds passed, I looked up for Frank he was too far ahead for me to get his attention. A group walking toward me did take notice and they were able to draw Frank's attention to me. I tried to get up, but my ankle couldn't bear my weight. It immediately swelled. Frank assisted me to a retaining wall across the sidewalk, I pulled down my sock and my ankle was already bruising, it didn't look good. He called for Uber on the spot, not even a minute later, I was hoisted into the Uber car. The pain worsened as were drove to the studio. Frank helped me inside and I stretched across the bed. I lost it. I wept. I had only been feeling good for a few weeks, I had just started exercising - I felt like I was just gaining back control of my life. Now, this! Pity party, for one. Frank calmed me, and left to get ice and a brace from Walgreen's. Anyone that's been around a while, knows that my right ankle is weak. After breaking it in Mexico (and walking on it for a week) on our honeymoon, it has never been the same. 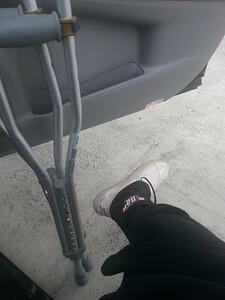 This was my 6th injury to it in 10 years, my last sprain four years ago took an extremely long time to heal, I was in a cam boot for three months. Years later it still gave me grief - I just learned to deal. Now, I was faced with it all again. Icing it made it no better. It still couldn't bear wait, this scared me. I've always been able to tolerate standing - it hurt like hell, but I could manage. Not this time. I agreed to go to Urgent Care. 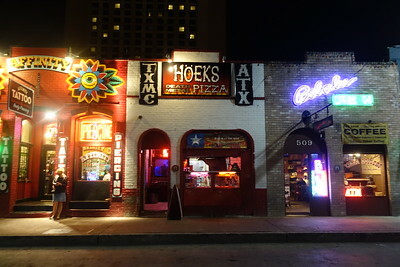 Frank found one downtown near University of Texas campus. I figured we'd be there all night. It was a great surprise to find only one patient waiting ahead of us. We were offered snacks and K-Cups while we waited. I was shocked when I was called back a few short minutes later. The rooms were clean and modern, each with its own TV. My vitals were taken, then I was wheeled away for xrays. No more than ten minutes later, the doctor was in to see me. The good news was that nothing appeared to be broken, but it was a nasty sprain. 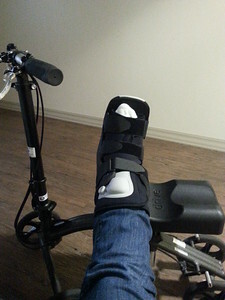 I refused pain meds, so after I was put in a lace up brace and given crutches, I was free to go. The whole process took about 30 minutes. That is unheard of by Vegas standards. At home, it takes that long to complete the paperwork to check in. 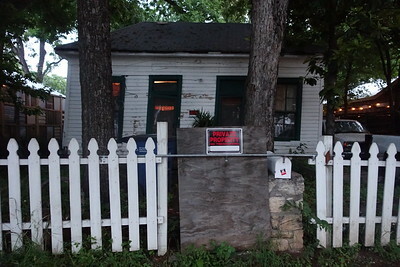 At least it was our last night in Austin. So, it wasn't like it was ruined the trip. It just made getting around a challenge. As I laid in bed that night with my foot elevated, I was so thankful for the Studio; we had a large king bed, a freezer for ice packs and strong WiFi for watching Netflix. I was grateful for my husband that sprung into action and took such good care of me. Despite my aches and pains, I'm one lucky girl.